Over the years we have built up a very innovative portfolio. We pride ourselves in connecting our clients to their audience via award winning websites. We are very proud of our projects and have built up long-term relationships with our clients. We have designed and developed many websites across a variety of industries and sectors. We've helped our customers to create effective branding, embrace the latest technologies and achieve top search engine rankings to help grow their businesses. Here are some examples of our estate agent website design, all of which are completely responsive, mobile-friendly, fully SEO optimised and built with the user in mind. All of these websites are built on the Resource Technique platform, with a fully customisable content management system. All of our estate agency websites comes with the latest technology and functionality and are completely optimised for SEO to help you achieve the best results from your new website. Lawrence and I just wanted to thank you for all your kind help, advice and professionalism in setting up and looking after our new website for Statons Estate Agents LLP, which everyone in the company is very proud of. We are all thrilled and delighted to have a new look and our new website. I was very lucky when Lawrence asked me and invited me to meet you and when we first arrived at your company, we were made to feel very welcome by all members of your team. In then speaking to you in more detail, you were able to correctly advise us on how to improve our website, which we had been using for many years. It took us a while to understand everything you wanted to do, but we did listen and we did appreciate everything you suggested and now looking at the website we are absolutely over the moon that we did it your way and we are very proud to be associated with your company. Every time we contact you, you make us feel very welcome, help us with all our enquiries large or small, and we look forward to many years of a happy partnership with you. We have been using Resource Techniques for quite a number of years now and, almost exclusively, have been massively impressed with them. From the moment they contacted us initially we have found them to be most professional, forward thinking and above all extremely friendly and easy to deal with. We have just instructed them to carry out the third update of our website for us and have also recently started to use their RTlive product to administer the sales side of our business. Although early days, our first impressions of this product are very positive, and we feel it is going to massively improve the efficiency of our business. 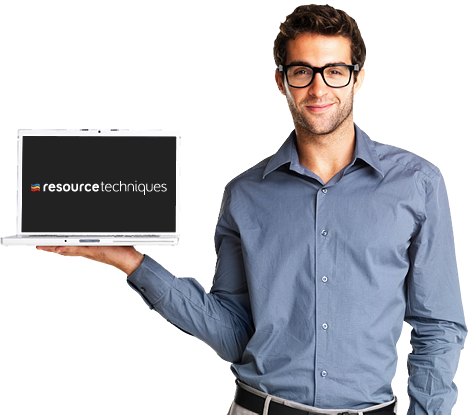 Without hesitation I would recommend Resource Techniques - they are a genuinely nice bunch of people, passionate about what they do, and certainly trying to do the very best job they can for their customers and succeeding! Wow… I love it! It looks and feels brilliant, it’s concise, clear and crisp which works perfectly. Let’s go ahead with it. I was recommended to Resource Techniques by the Mayfair Office. I researched their own website and others they created and realised that the company had a full understanding of not only our requirements but also of those of people who were likely to use it. From start to finish nothing was too much trouble and I really felt that the team at Resource Techniques were trying to create a site that we all would be very proud of and they did not disappoint. There is nothing more rewarding than being congratulated by your clients on how impressed they were with your website and how easy it was to use. We have an ongoing relationship with Resource Techniques and their service continues with their after sales support. I am sure they will continue to be at the cutting edge of property websites, and I am glad that we have found them. Thank you for all your help, we are really happy with our new responsive website. It looks great and we are very proud to launch it to our customers. What really helped was dealing with a company who understands our business. I would recommend Resource Techniques to any Sales or Letting agent looking for a new website. Following problems with another website designer, we instructed RT to build and design a new website and following this, we completed a document which set out our brand guidelines, company history and a whole host of other information which they would use to design the site. Tanya was our coordinator in the beginning and helped create a range of front pages to start work with and together with the help of our own brand designer, created what we believe is a really great home page, which is very clear, concise and easy to navigate. Once this was approved, we then worked closely with Trudie, who again was extremely helpful and patient and offered her help and advice from start to finish on the following pages. I was very keen to get the pages looking the way we wanted and the way I felt the company should be reflected on the net and she did a wonderful job of interpreting our vision and both she and her team worked hard to make sure the final product was exactly as we wanted. Having a website built is a stressful and time consuming process and you need a team who understand your needs and can also help to guide you in a positive way and they certainly did that! Well done to all! Dear Dean and Troy, This is to thank both of you, together with the rest of the team at Resource Techniques, for the amazing new responsive web site you have built for my company. The guidance, together with both creative and technical help and advice you have given to my company has been fantastic. The rebranding exercise was for me really difficult, however Troy’s design for our new Logo was brilliant I cannot thank you guys enough. And I would have no hesitation in recommending Resource Techniques to anyone looking for a “Stand Out Website. For their Estate Agency practice. New website- stunning end result and boosted rankings! We launched base in 2004 with a website, which we then replaced in 2012. However, with the pace of tech, by early 2015 we were having issues with the ranking of our site in search engines due largely to poor coding. With mobile traffic also around 35% at that time, our responsive design (which had been applied retrospectively) also wasn't great- and we knew mobile traffic would continue to grow. As such, we made the decision to build a new website and, after extensive research of our competitors and suppliers in our sector, shortlisted just 2 suppliers. Resource Techniques won out with the best blend of template-based design and customisation but what really won us over was their SEO expertise (lack of SEO expertise during the build phase of a website is disastrous- it's akin to building the structure of a block of flats without using an architect). The build didn't go quite as I had expected- but I put that largely down to the fact I am very demanding and particular- way above your typical agent. Digital is at the heart of everything we do, and I was adamant the website had to represent this in every way. Importantly the bumps were got over and the end product has exceeded our expectations. Feedback, from clients and the industry alike, has been fantastic and the mobile experience and speed of our site is incredible. It is just 2 months old and our rankings have already improved dramatically, and we are confident will be on track to achieve our targets within 6 months from launch as we had hoped for. The team at RT take incredible pride in their work and put every effort in to meeting their client’s needs- even an over-demanding, occasionally stroppy client like me. Would genuinely recommend their service for agents who want the best site they can get for a great price (i.e. aren’t yet willing or able to pay for a fully bespoke website from scratch). Need a new website? Make Resource Techniques your first call. We are extremely pleased with the final creation and feel sure that our business will continue to flourish, ably supported by the skill and steadfast support we receive on a regular basis from RT. If you are a business seeking a new website RT should be your first call, you won't be disappointed!! Resource Techniques set up our website in 2008 and last year renewed it completely. They are patient, constructive, responsive and creative - and patient! The team has steered us through the nightmare world that is IT, helping us with our software providers, IT support providers, email management. Running a small business is time consuming for owners and, thank you Resource Techniques, for taking some of the strain. I have been a client of RT for over 15 years. They built my current website and are in the process of building a new state of the art responsive website at the moment. Our website is vital to my business and it's great to have Resource Techniques as an IT partner to guide us through technological maze! Resource Techniques have now built two websites for us, the latest being a fully responsive site which has been extremely well received by our clients. I cannot recommend them highly enough. Their excellent staff are always helpful and able to communicate clearly at any level and they always respond quickly to any issues that arise. We’ve been using Resource Techniques for about 20 years to provide and maintain our website plus Estate Agency software. Nothing is too much trouble, they are approachable yet professional and take the time to explain technicalities at our level. We would happily recommend them for their good practical advice and excellent support. We have been using RT software for over twenty-five years, since it was running on a MS DOS platform! Close to that time, we featured in a property trade magazine because we had actually sold a house via the internet! Such was the infancy of the web at that time, but all down to RT being ahead of the game. As technology advanced and consumer attitudes changed, RT adapted and kept us bang up to date. Their knowledgeable staff are super friendly and have always been there to support us. Our website build and design process was very simple and straight forward and we are really delighted with the results. We’d have no hesitation in recommending their excellent, professional service. With only 3 seconds to impress can you afford to disappoint?